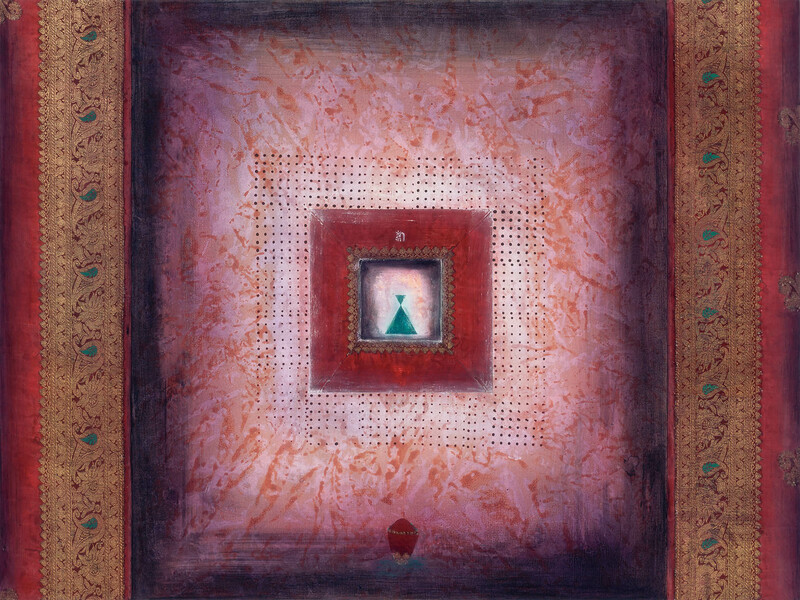 This painting is dedicated to Amoghasiddhi, one of the five Dhyani Buddhas. The five wisdom Buddhas represent the five principal qualities of the Buddha, and each one of them is related to one of the five elements. Amoghasiddhi, linked to the element air, embodies the commitment to fearlessly pursue transformation. In Tibetan iconography his vehicle is the winged man, called Garuda, eagerly flying higher and higher. On the painting Garuda is symbolised by the wings at the four sides of the canvas. Amoghasiddhi’s symbol is the visvajra or double vajra. The vajra or dorje is one of the most significant ritual utensils in Tibetan Buddhism. This diamond scepter symbolizes the supreme insight, which in its indestructible power cuts through all suffering and illusion. 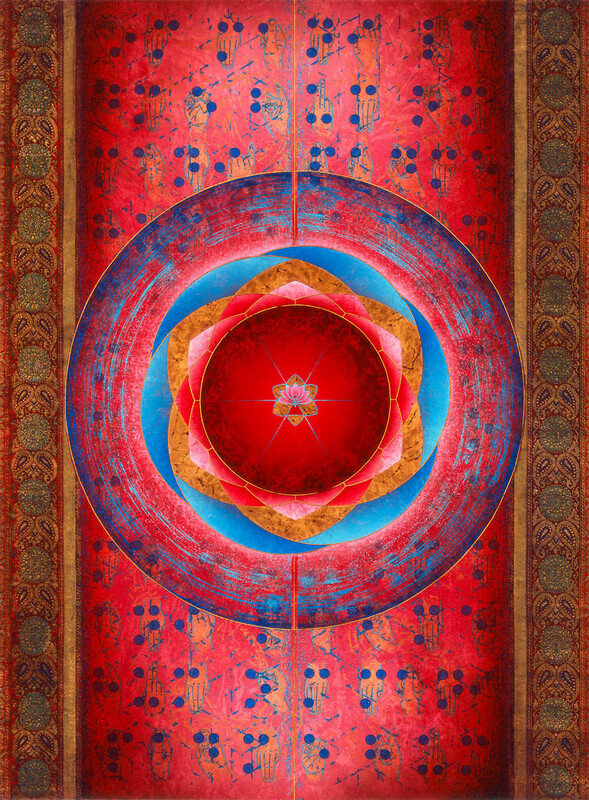 Its design contains all the principal elements of Tibetan cosmology. In the painting, I decided to surround the visvajra by 9 x 12 rows of boddhisattva figures. In the East the number 108 epitomises cosmic consciousness. As such these figures are a witness to the power of Amoghasiddhi, and an invitation to all of us to courageously walk the path of transformation. The five Dhyani Buddhas are an essential part of Tibetan Buddhism. Each one of these five wisdom Buddhas embodies a different aspect or quality of the enlightened state of consciousness. Each one is also linked to an element, a geographic orientation, a seed syllable and much more. As such they are fundamental in order to understand Tibetan cosmology. This cosmology is like a map of the universe, at the same time charting the different aspects of man. Micro cosmos and macro cosmos reflect each other. 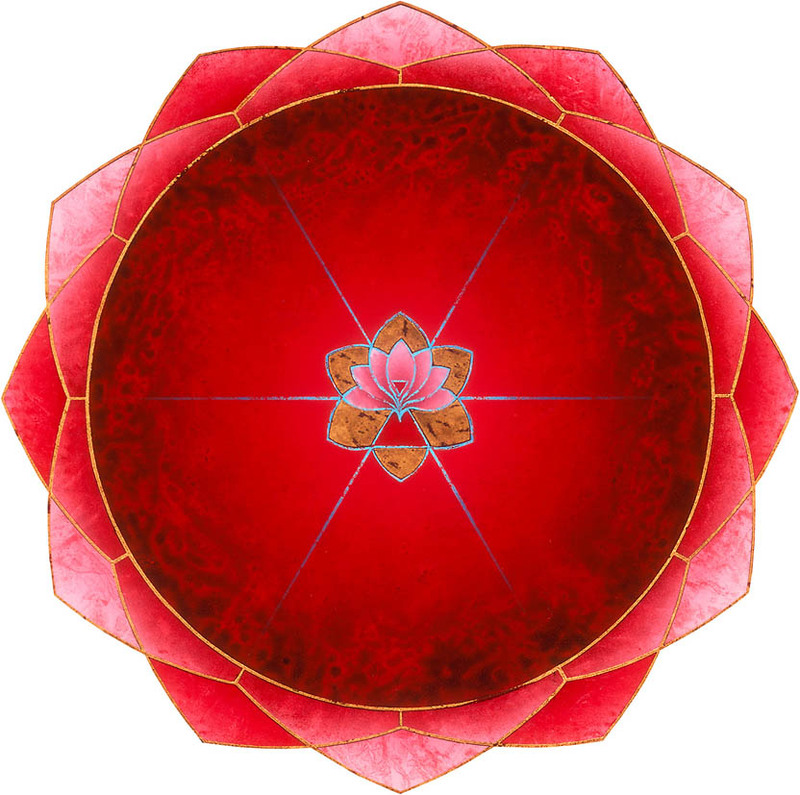 These mandalas function as mirrors, which can help us to discover the different facets of our nature. I used gold as well as charcoal in the process of creating this painting. These materials symbolise the process of transformation: charcoal, which is left after burning all that which is non essential; and gold, exemplifying truth and our true being. 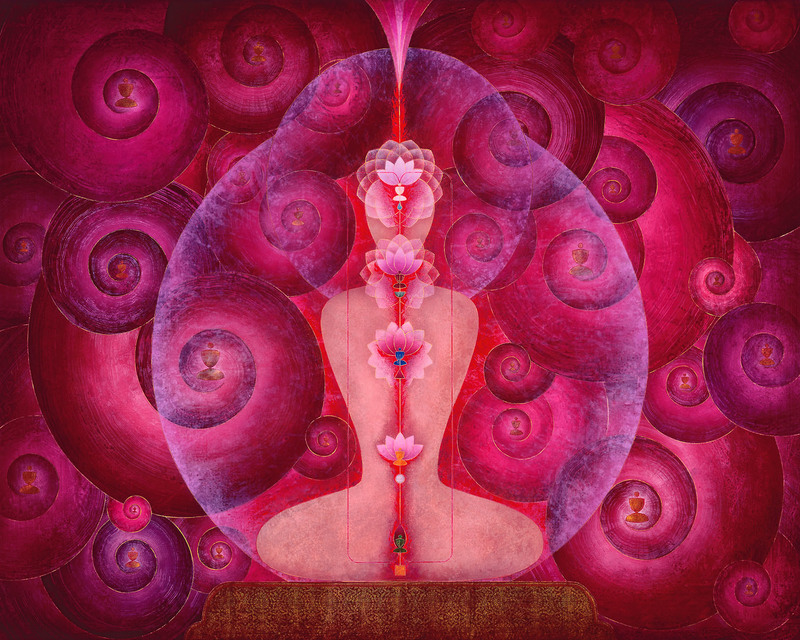 This painting mirrors the power of Avalokitesvara, the embodiment of universal compassion. Avalokitesvara is the dynamic aspect of Amitabha, one of the five dhyani Buddhas. He is the manifestation of supreme wisdom and the benevolent expression of the heart, which alleviates all suffering by transforming the different poisons into life elixir. It is told that thousand arms sprouted from Avalokitesvara's body in order to help wherever possible. 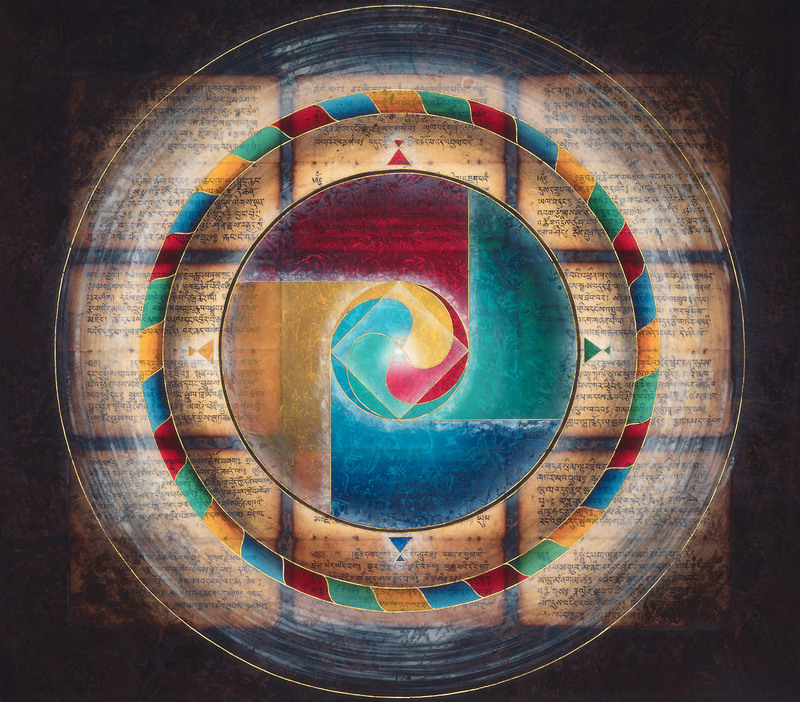 My painting shows a combination of the Buddhist wheel of life and the nature of compassion embodied by Avalokitesvara. The wheel of life categorizes the different incarnations of non enlightened existence. In the axis usually the three aspects which keep the wheel of suffering in a perpetual movement are shown. In my painting however, we see Avalokitesvara as the lotus bearer in the center. 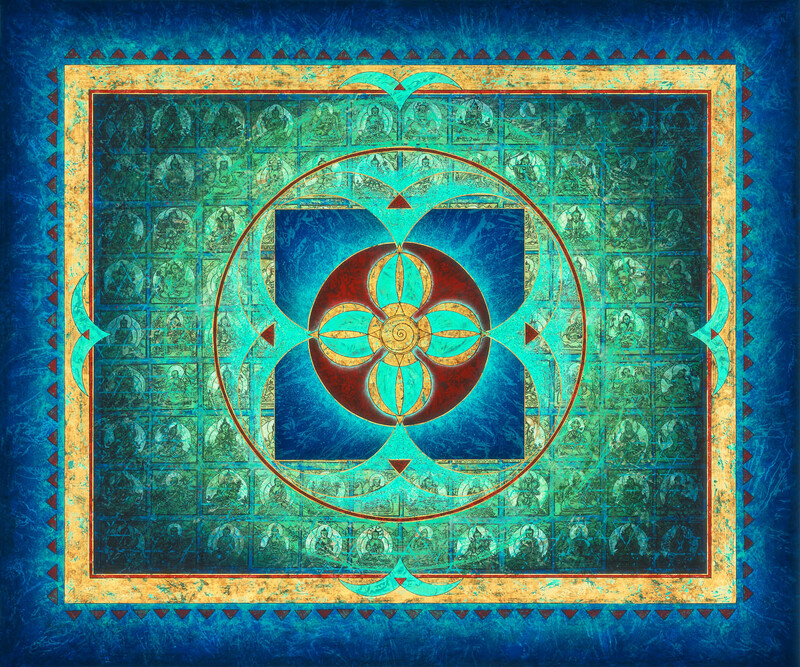 His mantra OM·MANI·PADME·HUM is resonating continuously in order to alleviate all aspects and causes of suffering, as shown in the traditional wheel of life. In the background of the painting, the mantra syllables are repeated in the corresponding Braille writing, as well as in sign language. This was my creative way to depict the endless effort of this enlightened Bodhisattva to bring happiness and true wisdom to all who are still spiritually deaf and blind. This is one of the paintings inspired by my visit to Tibet, and my keen interest in the yogic aspects of Tibetan Buddhism. This work specifically deals with a meditation technique called 'tummo' whereby inner heat is created. Vital energies generated by inner or outer means are drawn into one's central channel, causing the mystic fires to blaze. (...) Lights from the mystic fire flash into a hundred directions, summoning the blessings of Buddhas boundless as space. 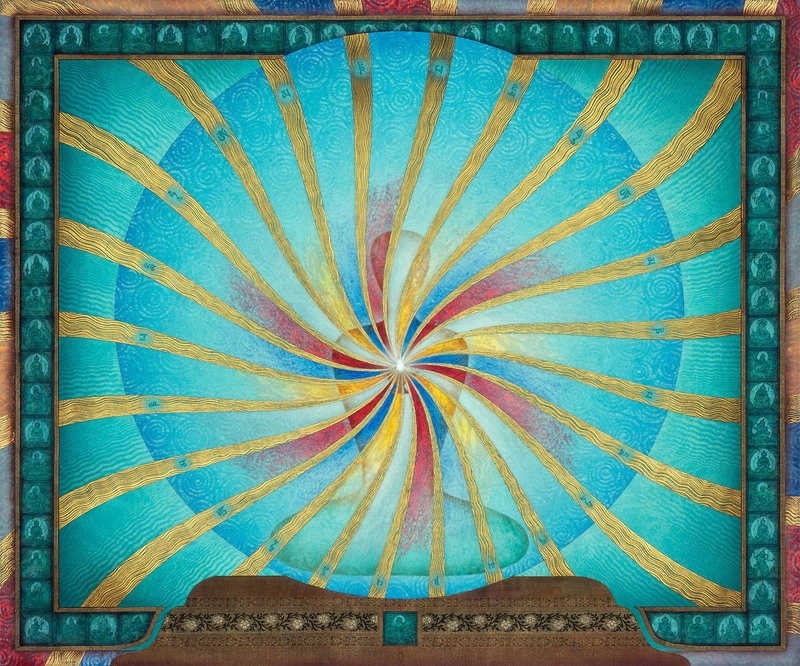 Inside the body shape the chakra centers and main energy channels are depicted. 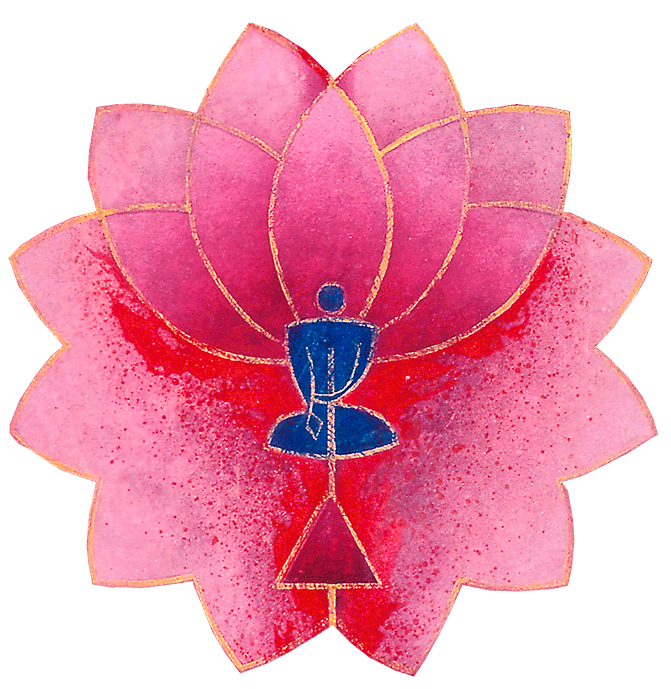 Tibetan yoga generally only charts five main chakra centers, rather than seven. 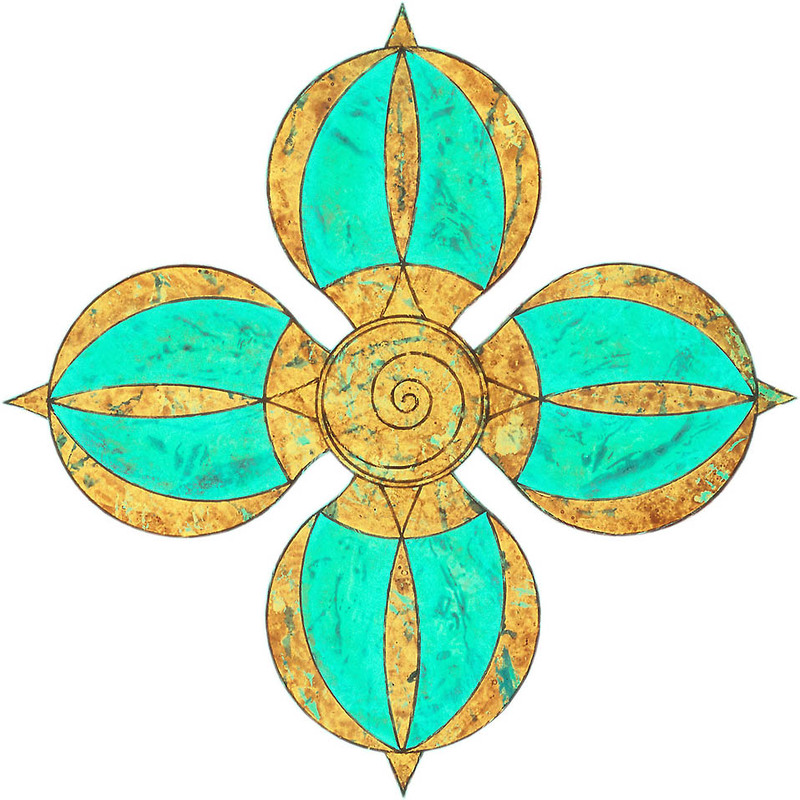 Each one of these five chakras is related to one of the five Dhyani Buddhas, as well as to the different elements earth, water, fire, air-wind, and space. The traditional Tibetan symbols for these elements, as well as each of the five Dhyani Buddhas with their respective hand gestures, can be seen inside the different chakras. Let others go to the monastery to offer lamps. that resides within the heart. Milarepa is known as the greatest Tibetan Yogi. Born around the year 1000, he at first was seduced onto the path of magic in order to avenge his abused family. Later on he deeply regretted his erroneous deeds, whereupon he started looking for a master. After a long search he met his true guru, Marpa. After many hardships, Milarepa was sent for a retreat in the Himalayas, where he remained many years meditating in secluded caves. His main nourishment consisted of the nettles he found around the cave. A simple soup was prepared in his cooking pot, his only possession. It is told that Milarepa's skin and hair gradually turned into a greenish shade. 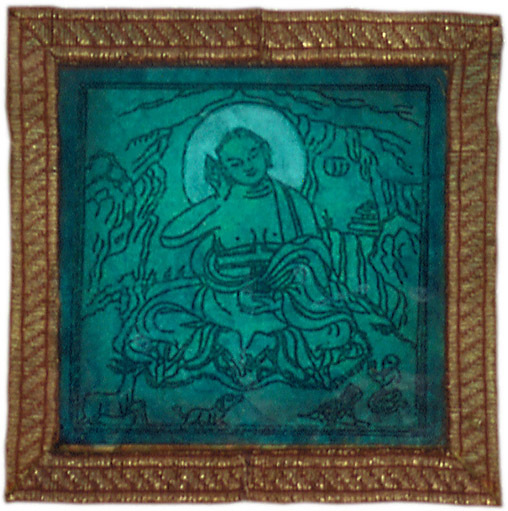 As such Milarepa is always depicted in a greenish colour, accompanied by his cooking pot. On the painting, this cooking pot can be found at the bottom of the outer square, which symbolises the body. The cooking pot with the nettle soup provided his physical nourishment. Inside the inner square we see the meditating Milarepa, surrounded by light. On top of this inner cave we find a small Om sign, representing the spiritual food for his inner being. The further we go inside the cave the more light is radiating, Milarepa himself being the source.